PRODUCT: LOW VOC SOLVENT BASED TPO/EPDM BONDING ADHESIVE. COVERAGE: 60 sqft/G. 5-GALLON CAN. PRICE/CAN. Flammable item. LTL Shipment Only. 45 cans/pallet. WeatherBond Low VOC (<250) Solvent Based Bonding Adhesive is a high strength solvent-based contact adhesive that allows quick bonding of TPO or EPDM membranes to various substrates. It is specially formulated using a blend of VOC exempt and non-exempt solvents to be in compliance with the state of California Clean Air Act of 1988 (updated in 1997) and as further regulated by California’s Air Quality Control Districts listing VOC grams per liter limitations. 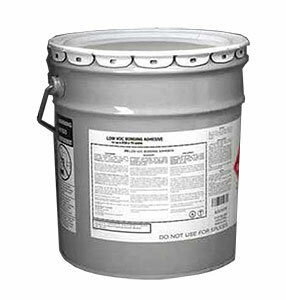 This product also meets the <250 gpl VOC content requirements of the OTC Model Rule for Single-Ply Roofing Adhesives. See Product Data Sheet (below) for details application methods. Low VOC Bonding Adhesive is designed for bonding WeatherBond TPO or EPDM Membranes, Carlisle TPO OR EPDM membrane, Versico TPO or EPDM membranes, and similar TPO or EPDM Butyl and Epichlorohydrin membranes to various substrates. Its also called SURE-SEAL 90-8-30A. About 60 square feet (56 sq m) per gallon (finished surface). Porous and irregular surfaces and substrates may require more bonding adhesive than the typical coverage rate. 2. WeatherBond Bonding Adhesive is FLAMMABLE - It contains solvents that are dangerous fire and explosion hazards when exposed to heat, flame or sparks. Store and use away from all sources of heat, flame or sparks. Do not smoke while applying. Do not use in a confined or unventilated area. Vapors are heavier than air and may travel along ground to a distant ignition source and flash back. A red caution label is required when shipping. 3. Avoid breathing vapors. Keep container closed when not in use. Use with adequate ventilation. If inhaled, remove to fresh air. If not breathing, perform artificial respiration. If breathing is difficult, give oxygen. Call a physician immediately. During application, efforts must be made to prevent fumes from entering the building via air ventilation ducts. Do not place open containers or mix adhesive near fresh air intake units. When possible, shut down or seal off the closest units . 5. Avoid contact with eyes. Safety glasses or goggles are recommended. If splashed in eyes, immediately flush eyes with plenty of clean water for at least 15 minutes. Contact a physician immediately. 6. Avoid contact with skin. Wash hands thoroughly after handling. In case of contact with skin, thoroughly wash affected area with soap and water. Note: Solvent resistant Hycron gloves are recommended when using this product to protect hands from irritating ingredients. 7. Do not thin Bonding Adhesive. Thinning will affect performance. Excessively thick or gelled material should be discarded.